The Eleanor N. Dana Cancer Center at The University of Toledo Medical Center is recognizing National Breast Cancer Awareness Month with free events aimed at early detection and education about the disease. “Breast Cancer Awareness Month is a good time to think about having your mammogram,” said Jan Tipton, a registered nurse and manager of the Infusion Center at the cancer center. 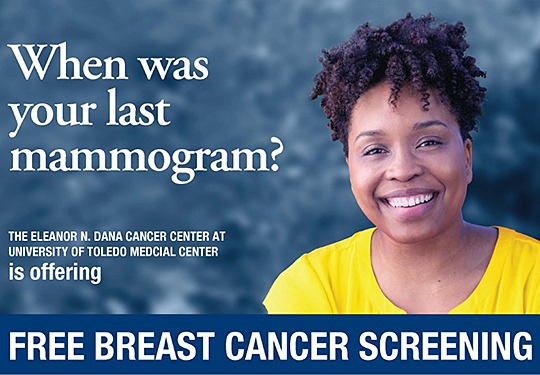 On National Mammography Day, which this year falls on Friday, Oct. 19, the Eleanor N. Dana Cancer Center is offering free mammograms and clinical breast exams for women who are uninsured or underinsured. One in eight women will develop breast cancer in her lifetime, but statistics show that one-third of women older than the age of 40 have not had a mammogram in the past two years. “By doing regular screenings, we can detect these cancers early and hopefully prevent patients from needing more invasive treatments,” Tipton said. Women who have not had a recent mammogram or those who have found a lump during a self-breast exam are encouraged to register. A limited number of spots are available. To register or inquire about eligibility, call 419.383.5170. Later this month, the Eleanor N. Dana Cancer Center will host a free panel discussion with three of its breast cancer specialists to talk about the precision treatment options available at The University of Toledo Medical Center. The program will begin at 5:45 p.m. Thursday, Oct. 25, and feature breast surgeon Dr. Heather Klepacz, medical oncologist Dr. Danae Hamouda and radiation oncologist Dr. Tangel Chang, who will speak about the latest advances in breast cancer treatment, including the most individualized treatment available today. A question-and-answer session will follow. The panel discussion is open to the public, but reservations are requested by emailing danacancercenter@utoledo.edu or calling 419.383.5243. This entry was posted on Wednesday, October 17th, 2018 at 3:40 am and is filed under Events, Medicine and Life Sciences, News, UTMC, UToday .